Relief Shampoo is a soap-free, cleansing shampoo that is used to clean the coat and temporarily relieve itching, flaking, and irritation of the skin. 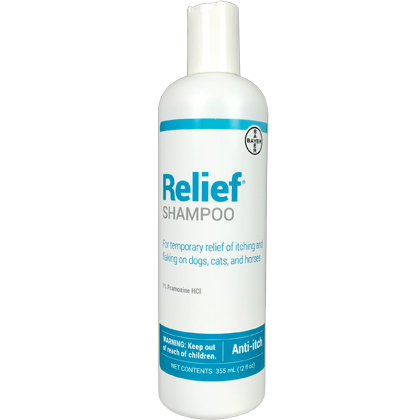 Relief Shampoo contains pramoxine which is used to relieve itching and the discomfort of skin irritation. It also contains colloidal oatmeal, which is used to soothe and condition the skin. For topical use on animals only. If redness or irritation persists or increases, discontinue use and contact your veterinarian. Avoid contact with eyes. If eye contact occurs, rinse thoroughly with water. Relief Shampoo is used as a cleansing shampoo and for temporary relief of itching and flaking caused by seborrheic dermatitis. Relief Shampoo is a non-prescription (OTC) product. Wet coat thoroughly. Apply sufficient shampoo to lather well into hair coat. Allow to stand for 5 to 10 minutes. Rinse thoroughly with water. Use as often as necessary or as directed by veterinarian. If irritation develops consult a veterinarian. For veterinary use only. Do not use in eyes or nose. Relief Shampoo is a soap-free shampoo used for cleansing the hair coat and the temporary relief of itching, flaking, and irritation. Do not get in the pet's eyes or nose. Use Relief Shampoo as often as necessary, or as directed by your veterinarian. Shake well before using. Wet the pet's coat thoroughly. Apply enough shampoo to lather well into the pet's hair coat. Allow lather to stay on pet's coat for at least 5-10 minutes. Rinse thoroughly with water.